While this might sound like a strange combination at first, you definitely won’t regret giving it a try. Don’t be surprised if it ends up becoming your favourite dessert. Place the bacon on a baking tray and grill until crispy. Place a large piece of tin foil on a heat proof surface and spray with baking spray. Spread the grilled bacon out on the foil. Place the sugar, water and butter in a medium saucepan and stir over a medium heat until the sugar has melted. Once melted cook on a high heat until a golden caramel is formed. While hot, pour the caramel onto the bacon on the foil and allow to cool completely. Note: The caramel will be very hot, take care not to touch it. Once cooled break the praline into shards. Most of it can be crushed into little pieces, but keep some aside for garnishing if desired. Remove the ice cream from the freezer and beat until soft- this can be done with an electric mixer or by hand. Once the ice cream is soft enough, mix in the crushed praline. Place the ice cream back into the freezer to set. Store the excess praline in an airtight container until you are ready to serve. 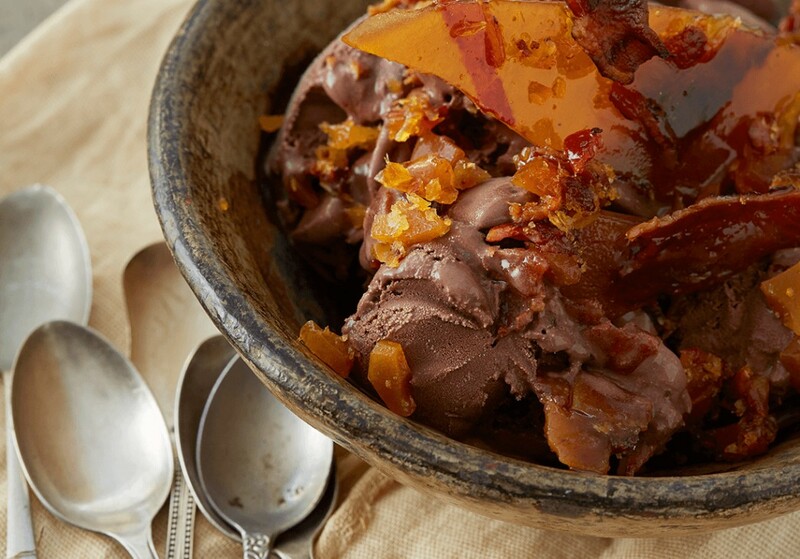 Serve scoops of ice cream topped with shards of praline.